The proportion of the senior population (aged 65 and older) has been increasing steadily over the past 40 years. 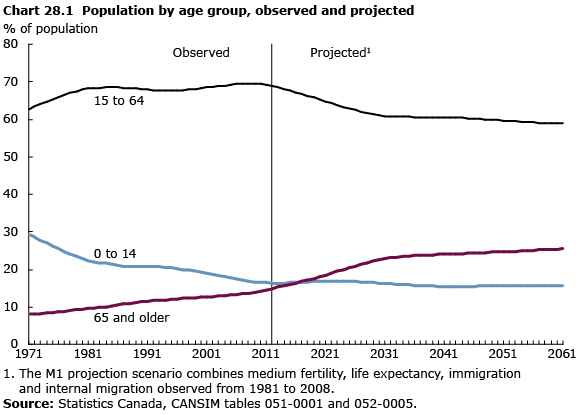 From 1971 to 2011the proportion of seniors in the population grew from 8% to 14%. According to demographic projections, the proportion of seniors is expected to increase rapidly until 2031, when all the baby boomers will have reached 65. Seniors could represent between 23% and 25% of the total population in 2036. On July 1, 2011, Canada's senior population stood at 5.0 million. Of this total, 1.4 million individuals were aged 80 and older, while 7,600 individuals were aged 100 and older. Between 2015 and 2021, the number of seniors is projected to exceed the number of children aged 14 and younger for the first time ever. By 2036, the number of seniors could reach between 9.9 and 10.9 million people. A study on consumption patterns of aging seniors found that in the early 1980s, a group of households whose heads were in their late 40s spent an average of $36,600 per adult per year (in 2002 constant dollars) on total expenditures. By the time the household heads reached their mid-50s, this had increased to $40,000. As the group aged further, expenditures fell by almost $10,000, with most of the decline happening when the household heads were between their mid-50s and early 60s. The decline in overall expenditures was primarily due to a drop in taxes paid, consistent with declining incomes during the retirement period. Between their late 40s and early 70s (1982 to 2008), taxes paid by individuals declined by more than $3,000, accounting for 58% of the overall decline in expenditures. When the household heads were in their late 40s, more than one-third of their household consumption dollars went to food, clothing, personal care and health care. Just over 30% was spent on residence and properties, while transportation and other consumption (including leisure) accounted for 16% and 18% of expenditures, respectively. As the household heads reached their early 70s, the proportion of household spending on residence and properties increased to 43%. Health care spending also increased over time, doubling from 3% to 6%. In contrast, the proportion spent on food, clothing and personal care declined to 28%. The households also spent less on other consumer goods (including tobacco and alcohol), administrative and financial fees, membership dues and service charges. Transportation expenses remained relatively stable as the group aged, accounting for between 16% and 19% of total consumption. In recent years, unattached senior women's average total income from all sources has increased, rising from $27,600 in 2003 to $31,400 in 2009 in 2009 constant dollars. Nevertheless, their average income remains lower than the average total income of $37,000 of unattached senior men in 2009. The proportion of senior women with a low income has declined over the last three decades. In 1978, 34% of senior women had a low income, decreasing to 11% in 1998. In 2009, the proportion of senior women with a low income decreased even further to approximately 7%; however, this is still more than twice the proportion of senior men with a low income (3.4%). From 1996 to 2006, the proportion of working seniors (aged 65 and ) climbed from 11.8% to almost 14.8% among men, and from 4.0% to 5.8% among women. However, 44.1% of senior men and 28.6% of senior women who had a job in 2006 were self-employed. Moreover, self-employment among older Canadians increased by more than 100,000 people during the 2008–2009 recession. The proportion of workers who are self-employed is even higher among older seniors. In 2006, 39.4% of working men aged 65 to 69 were self-employed, but more than half of those still working after age 75 were self-employed. Among women, the self-employed made up one-quarter of working women aged 65 to 69, and more than one-third of those aged 70 and older.